Customers such as Firestone/Bridgestone Tire Stores, Les Schwab Tire Stores, Fabc Equipment lnc. (Caterpillar dealer), several State, County, and Local Transportation Departments, countless New Car Dealers, and Independent Repair facilities, have found that the Renegade has helped them to , Cost effectively reduce the hazardous waste stream, with a reliable, easily maintained unit that is well supported through a network for service and trouble shooting. The unit meets or exceeds the existing laws and regulations for safety and environmental compliance. Thereby eliminating the need to store or process spent hazardous waste solvent fluids at your facilities, thus reducing the overall operational and maintenance costs for you. 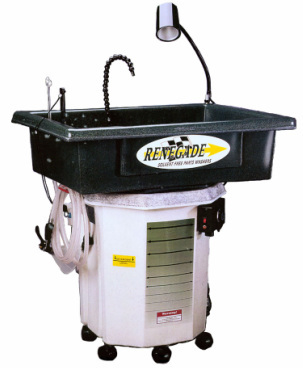 The Renegade solvent free parts cleaner is the most advanced water based parts cleaning system on the market today. It has been exclusively designed, engineered, and developed to be a low maintenance, cost effective, and easily repaired system to give the end user years and years of trouble free service.